That's right: last week at SAE World Congress, Raser Technologies unveiled a prototype Hummer H3 that gets 100 miles to the gallon. Insane, right? We agree. 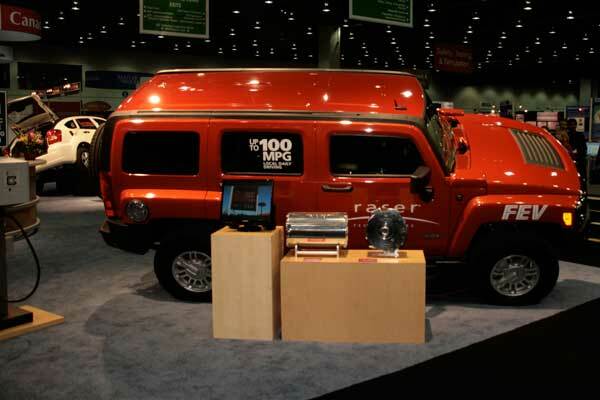 Raser partnered up with FEV to turn the famously non-environmentally sound gas guzzler around. The prototype boasts an E-REV power train engine, and three lithium ion battery packs under the rear of the vehicle. The batteries provide enough juice for about 40 miles, when the range extender starts up, providing an additional 400 miles -- averaging about 100 MPG -- before it needs to be plugged in again. The company is looking to start up low volume production by 2011, though there is no word on possible pricing at this time. Hey -- who says electric cars have to be small, tasteful affairs? Fierce! One more shot after the break.